Washington (CNN) - House Speaker John Boehner Tuesday forcefully denounced the Democrats' campaign theme that they are for the middle class and Republicans are for the wealthy – saying the politics the president is running on are "almost un-American." "This is a president who said I'm not going to be a divider, I'm going to be a uniter, and running on the politics of division and envy is – to me it's almost un-American," said Boehner. Speaking to a small group of reporters in his Capitol office ahead of the president's State of the Union address, Boehner said Democrats have been trying to push the same middle class versus wealthy theme for "eighty years" and suggested it won't work for President Obama. "He can run, he can hide, make all the noise he wants – but it's going to be a referendum on his policies, and they haven't worked," said Boehner. Boehner backed up his comments and philosophy with a quote from the late President John F. Kennedy, saying "a rising tide lifts all boats" – a phrase often used to suggest that, when the general economy is good, everyone benefits. The House speaker accused President Obama of being "AWOL since Labor Day" and said the two men haven't spoken since December 23rd – over a month ago. "They've been in full campaign mode since then and I expect tonight we'll see more of the same," said Boehner, who also said the State of the Union speech was "written by the campaign." Still, he said he hopes the president produces an "olive branch" to Republicans in his address to Congress. "I've made clear to my members, while we have big disagreements about the kind of policies that are best for the country, our job still is to find common ground on behalf of the American people," he said. Boehner hit a growing, coordinated theme from Republicans about President Obama – that he acts as though he is not responsible for the current economy – but he is. "The president would like people to believe tonight this is his first year in the White House, it's as though he's taking the place of Rip Van Winkle and forgetting the fact that he's been president for 3 years. The first two years he had a Democratic Congress who gave him everything he wanted and the fact is his policies have not only not helped the economy, they've made it worse." Boehner insisted the goal is to "work with the president, especially on the issue of jobs," and said the only thing on the Democrats' agenda is extending the payroll tax cut for one year. On the subject of Mitt Romney's just-released taxes, Boehner noted that Romney seemingly paid what was legally due. Pressed whether Romney's income and his 14 percent tax rate would work against him with voters, Boehner took a different view, saying he thought Romney having paid three million dollars in taxes "would strike most people as a lot of money." Though Boehner served as a Gingrich lieutenant when Gingrich was Speaker of the House, he insisted he was going to "stay out" of the GOP primary fight because he knows all the men still running. He would only say the primary process will "produce a good candidate and I expect to support him." Some Republican editorial writers are still calling for someone new to enter the GOP race. Boehner said he could only see that happening if one of the candidates running now fails to get enough delegates to win. Does he think that could happen? "I don't know," Boehner replied. While he suggested the primary season has been a good one, Boehner also complained of too many debates and too long a process calling it "not the most efficient way to select a candidate." "My point is this has been a very long grueling process, and it probably prevents good people from making a decision to run," said Boehner. Still, pointing to the Democrats lengthy, contentious 2008 primary season, which resulted in the election of President Obama, Boehner does not think a drawn out primary will hurt the Republican nominee. "I'm not concerned about how long the primary process has been nor am I concerned about how long it lasts," said Boehner. The House Speaker, who said last year he barely knew the president, now says the two have a relationship that's "actually pretty good." "You'd be surprised, we banter back and forth," he said. When pressed on what appeared to be a contradiction - that he claims to have a good relationship with a president he hasn't spoken to in a month, Boehner insisted they have a good personal dynamic, but their working relationship was "unproductive." The two men spent a lot of time negotiating over the past year - especially on an ill-fated debt ceiling deal. 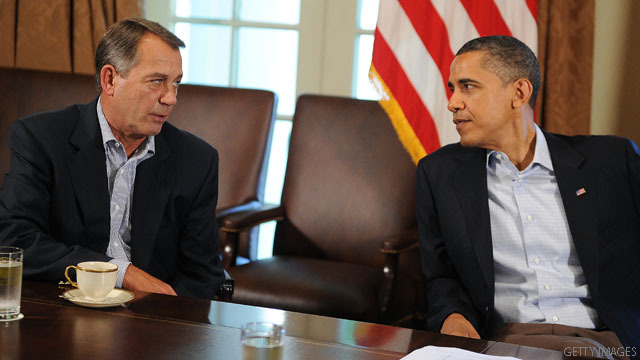 Boehner was biting when it came to the President's negotiating skills. "It was like negotiating with someone who never negotiated anything," said Boehner, "at some point someone has to say 'yes.'" The Speaker said the two men "come from two different planets" when it comes to their philosophies. "We understand each other well. We speak a different language. I can never get him to say 'yes,'" he said. The House speaker's first year in the job marked some difficult moments trying to corral his members to find compromise – especially on issues of spending. Boehner said he made clear to House Republicans at their retreat last week not to let the perfect be the enemy of the good. He said he told them "when they push for too much they actually get less than what they would have gotten." When asked of the members got it, Boehner replied with a smile, "some got it, some probably didn't." Disgusted with the "Speaker" of the House. He does not speak for me. Can't this guy just get over himself and do something for the American people? From the words of President Reagan, there they go again. The reversal of Obamacare will propel the Republican candidate to victory in November. Between Mittens and his 14% tax rate and Gingrich and his everything, the Republicans better hope that they don't loose both Houses as well. As GOP conservative George Will so eloquently put it, every Republican running for office, from the lowest dog catcher to members of Congress woke up Sunday morning and went "uh-oh". John Boehner is a complete weakling. He gets bullied by the Tea Baggers and genuflects to the Church of Koch. He's an overpaid mouthpiece for the shrill right wing. Can't wait until he loses his job in November. We just need to take truth at his word, excuse me faux news word, that this is the worst presiding ever. Ni guess theynslept right through eight years of the shrub! BTW the President is half black and half white. You can't change that. you are starting to sound more pathetic each day. Lay off the coffee? I feel sorry for Boehner. He has to represent the crazies in the House. It’s like a receiver being led across the middle of the field by the QB for a pass when he knows he’s going to get creamed but is expects to make a perfect catch and (get this) not fumble after the crushing hit. Sort of like the last battle he had over raising payroll taxes when he got crushed. Just what is "un-American" about supporting a strong middle class in America? These GOTP goons have got to go – beginning with this one. If I were the President, I'd reach over and clock that lying nitwit. What is truly "Un-American" is the way that the GOP puts regaining power over what is good for the country. Boehner and the GOP are way more interested in trying to make President Obama fail so they can regain the presidency than in doing what is right for the country and working Americans. President Obama has managed to stabilize the economy and start adding jobs even while dealing with GOP obstructionism. What has the GOP done? Held everything up insisting on goodies for the ultra-wealthy and big corporations such as MORE tax cuts and getting rid of regulations that protect consumers and the environment. Boehner is ridiculous and should be sent home along with as much of the GOP as possible in 2012. Show the GOP that working Americans are not going to put up with their disregard of what we are facing. Kick them out until they get the message and change their policies to represent ALL Americans and not just those who can give them tons of cash. Wow, they are alive. So what has the REPUBES congress done since they took over. Abortion rights, abortion rights, abortion rights. I guess they are real serious about creating jobs!! Please don't talk about the pipeline that produces unhealthy consequences for us!!! I hope republican lose the house and the dem gain more seats. These republicans are nutts. Wake up american let vote these republicans out of the office and send Boehner, Cantor, McConnell, to the welfare office. remember the S.C. debate. Gingrich said he could ONY work with a republican house & senate. Obviously he cannot work people who may disagree with him. The politics the president is running on are "almost un-American." They ARE un-American! My God I can't wait until November just to see that arrogant smirk wiped off Boehner's leathery face as he's forced to relinquish the Speakership to a Democrat. What a complete and utter failure. He can't even keep his own party in line, let alone the entire House. His partisanship and incompetence have single handedly resulted in the least productive Congress of the past 80 years or so. Boehner exemplifies everything that is wrong with Washington and with the Republican Party. He's going to have a very blue November. "It's only called class warfare when we fight back."